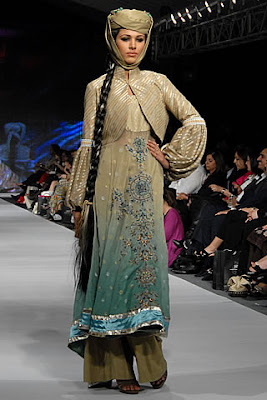 Pakistan held it's first ever fashion week last month, and 32 designers selected by the Pakistan Fashion Design Council showcased their collections in Lahore. 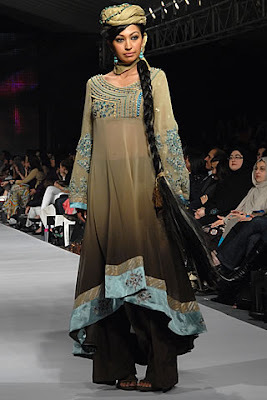 Dedicated Pakistani fashion site Fashion Central has extensive photo albums from all the shows, and here's a selection of outfits I thought were interesting! I love the short jackets and exaggerated sleeves on these outfits, and the colour scheme definitely has that urban/earthy feel to it! The last outfit intrigues me the most, is it a jumpsuit? That's what it looks like from the way the fabric is gathering round the model's ankles!